defining choral fusion with sassy sophistication. Hello to all our amazing fans and a very sweet welcome to our new subscribers! 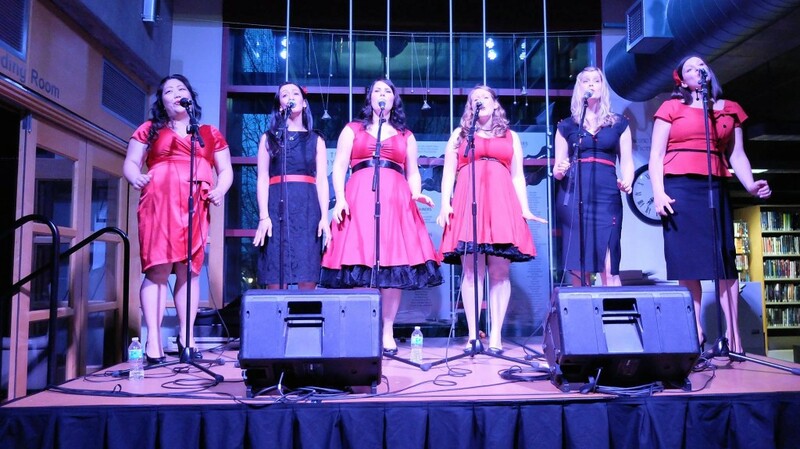 Spring is shaping up to be a great season for the Scarlettes – here’s the scoop! On a rainy Friday night in West Vancouver, we were excited to be the feature artist at the West Vancouver Memorial Library’s Concert Series. It was a memorable night, with an enthusiastic audience of over 180 people. As four of our six members grew up in West Vancouver, seeing the arts thriving in our community is especially meaningful for us – we were so honored to be a part of it. The set included our usual diverse and interesting repertoire from upbeat classic pop favorites, to world pieces, to contemporary…all sung a cappella. We kicked the show off with a new world piece in our repertoire – O Sapo, a Brazilian party song. And a party it was – we had an incredible time on stage and celebrated with a bubbly after party. In other news, we are busy perfecting a few of our favourite pieces to showcase at the Kiwanis Music Festival on Saturday, April 11th at 1:30 pm (Bethany Baptist Church in Richmond: 22680 Westminster Hwy, Richmond). We are looking forward to participating in our first organized music festival and receiving feedback from an esteemed panel of adjudicators. One of our objectives as a group is to perform a cappella music at a high caliber – we look forward to continuing to push the envelope, and connecting with the choral community. We hope to see you there! AND – Stay tuned for an exciting announcement about a Sweet Scarlet spring show shortly!